Next Monday night, please join us at the bar Racines NY to welcome 2 very talented vignerons, Marine Leys - La Vignereuse & Rémi Dufaître from Beaujolais. In Gaillac (South West), Marine found her paradise after a career in film production. Working with the (underrated) varieties of the region, she makes a range of very original, terroir-driven yet highly drinkable wines. . In very few years, Rémi managed to become a name in the Beaujolais. 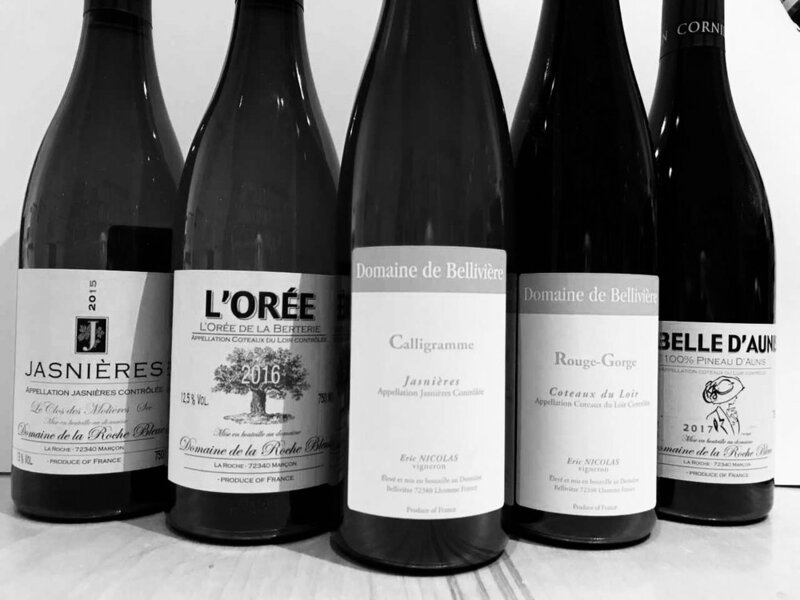 Following organic farming from the beginning, as well as the vinification methods put on the limelight by the "Gang des Quatre", his wines really reveal the incredible variations of Beaujolais soil types & micro-climates too often unappreciated. We will pour starting 6 pm. Filght $30. No reservation needed. Special snack by Chef Diego Moya. TUESDAY NIGHT FLIGHT - Muscadets & Oysters with David Lillie! Tuesday night, David Lillie will be with us behind the bar for a very special Oysters and Muscadets treat!! 2018 Domaine de la Pépière "La Pépie"
2017 Domaine de la Pépière "Clos des Briords"
2017 Domaine de L'Ecu "Granite"
2015 Jo Landron "Haute Tradition"
2014 Domaine de la Pépière "Clos des Briords"
2012 Domaine de la Pépière "Clisson"
Please call Racines, 212-227-3400, or email info@racinesny.com for reservations. WINE ON WHEELS's "Rock the Casbah" J.-L. LeDû Fundraising! Join Wheeling Forward for their 2nd annual Wine on Wheels ‘Rock the Casbah’ Dinner & Wine Bash! They created the Jean Luc Le Dû Scholarship Fund in memory of our friend, colleague and mentor Jean-Luc Le Dû. Jean Luc was instrumental in the development of Wheeling Forward and boldly provided support, enthusiasm and an overall zeal in pursuit for our cause. This scholarship in his honor is used to assist Wheeling Forward members and those in need with their education; whether it be getting their GED or College Degree, continuing our mission to help those with disabilities achieve their goals today! This 3 Course dinner is BYOB so they encourage you to bring a bottle (or bottles) of wine from your cellars to share alongside some special donated bottles for a night of conviviality, inclusiveness and fun. WINE DINNER & TASTING with Thierry Germain from Saumur-Champigny! We are thrilled to welcome one of the most interesting vignerons in the Loire, Thierry Germain from Domaine des Roches Neuves in Varrains. Coming from Bordeaux more than 20 years ago, Thierry grows today more than 20 ha in biodynamie and crafts superbly expressive Cabernet Franc and Chenin on the different terroirs of Saumur. 22 seats available, menu, line-up and price to be announced shortly. GUEST CHEF - John Winter Russell from "Candide" in Montreal. Chef Russell, a champion of all things local in Canada, will collaborate with Chef Moya on a superb menu of Canadian/American cuisine accompanied by wines from Up North chosen by Pascaline and Arnaud. Discover a new expression of California Sacramento Delta wine with artist turned wine-maker Craig. Producing compelling Chenin and Zinfandel - on its Haarmeyer and St Rey labels, you will enjoy a genuine taste of this part of the US. Flight and price to be announced on our website and Instagram shortly. "Wines of Nature" - A Dinner in Celebration of Clos Roche Blanche, Wed, April 3rd at Racines NY! Please join us at Racines NY on Wednesday, April 3rd at 7pm as we host Didier Barroulllet of the Clos Roche Blanche in a celebration of this important Loire Valley estate. Beginning in the 1980s, Catherine Roussel and Didier Barrouillet at the Clos Roche Blanche in Touraine began a journey of discovery beginning with organic farming, through biodynamics and beyond, to some of the most intelligent and beautiful farming and winemaking we have ever experienced. Their estate became part of a movement, principally in the Loire Valley and Beaujolais, leading to more natural methods of farming and vinification that have inspired vignerons all over the world. Through their importer, Louis-Dressner Selections, their wines became known and loved by consumers in the US and helped to create the enormous interest in "wines of nature" in this country. Didier Barrouillet will join us, there will be a few speeches, dinner, and lots of 2014 Clos Roche Blanche to drink. Feel free to bring bottles of CRB or comparable wines to share. $50 for the flight, that will start at 6 pm, we have 10 seats available! Special snack by Chef Moya and his team! To book please contact @racines_ny at info@racinesny.com. See you Tuesday! Racines NY is glad to welcome Ostiane Dürrbach from Domaine de Trevallon for a very special dinner featuring 8 different vintages! Eloi Dürrbach planted his first vineyard in the Alpilles in 1973. 15 hectares of red are produced, made from equal amounts of Cabernet Sauvignon and Syrah, and 2 hectares made mainly from Marsanne et Roussanne. We couldn't be more happy to have among us Ostiane, Eloi's daughter, for this evening. Chef Diego Moya put together a beautiful 4 courses dinner to pair with those Provencal wines full of character. Dinner will be hosted on Wednesday, March 27 at 7PM. $195+Tax&Gratuity. We look forward having you for this awesome dinner! This Monday, 25th of March we are super lucky to welcome behind the bar 2 fantastic vignerons from the Loire, Tessa Laroche from Domaine aux Moines in Savennières and Thibaut Boulay from Domaine Boulay in Sancerre (an estate dating back to 1380). Two very different expressions of the greatness of white wines in the Loire, from the schist of Roche Aux Moines to the superb Kimmeridgian marls of Chavignol - Les Monts Dammés, La Grande Côte and Clos De Beaujeu. We will do a mini-vertical of Tessa's, and an exploration of the different cuvées made by Gérard, including his work with Pinot Noir. Tessa and Thibaut will be there from 5.30 to 7.30, and we will continue to pour the flight all night, with a special bite by Chef @diegomoya. $35 for 6 wines. See you on Monday - and more to come for the rest of the week! THURSDAY NIGHT FLIGHT - HERVE VILLEMADE IN THE HOUSE! This Thursday 21st and Spring Day, we are thrilled to welcome a very special guest behind the bar at Racines NY. When our friends at Louis/Dressner Selections told us Hervé Villemade would be in town, we had to invite him to pour his absolutely fantastic wines, and share his passion with you. A fighter of Cheverny and Cour-Cheverny AOCs and no BS viticulture & winemaking, Hervé magnifies what romorantin, pinot, gamay can do in this part of Touraine. Organically certified, using a tiny bit of sulfur only if needed at bottling (he is very allergic to it), his wines are some of the most transparent examples of low intervention vinification. Chef Diego as usual now will prepare a special bite to pair with the wines! Check instagram or our website - the line up will be announced shortly. See you starting 6pm at the bar! Be ready to have your palate and your brain on fire! Flight is at $35, we will start pouring at 5.30. First Come First Serve. See you Tuesday! This Tuesday March 12th, please join David Lillie from @chambersstwines for a celebration of Beaujolais! It will be a fantastic occasion to taste and explore the different variations of Gamay grown in the myriad of terroirs the region offers. Fleurie, Chiroubles, Régnié, Morgon, the beautiful work of these benchmark vignerons - Alain Coudert, Christian Ducroux, Georges Descombes, Jean-Louis Dutraive, Jean-Paul Thevenet, Jean-Claude Chanudet - will reveal the diversity and identity of these crus. 2017 Domaine Chamonard, Fleurie, "La Madone"
2017 Jean-Paul Thevenet, Morgon, "Vieilles Vignes"
2015 Jean-Louis Dutraive, Fleurie, "La Part des Grives"
2013 Christian Ducroux, (Régnié), "Patience"
2009 Clos de la Roilette, Fleurie, "Cuvée Tardive"
This Thursday 7th we are really happy to welcome behind the bar starting 6.30pm one of our favorite vignerons - Julien Guillot from Vignes du Maynes, thanks to our friends at Chambers Street Wines and Camille Riviere Selection! Julien is a real modern time wine hero producing some of the most compelling Burgundy in the southern part of the region around Cruzilles (Mâcon). In his words “ The vineyard has never had any chemicals used on it and has always been farmed with the greatest respect for the earth. From the very outset, my grandfather decided to make wine organically, using no chemicals, herbicides, pesticides or sulphur. My father, Alain, later took over the domaine, keeping the same philosophy. I joined the domaine in 1998, which is when I introduced the first biodynamic preparations. I then took over the domaine officially in 2001 and decided to convert the entire vineyard of seven hectares to biodynamic farming”. In David Lillie & Amanda Bowman’s words “The Clos du Vignes du Maynes in Cruzilles is a sort of alternate universe to modern Burgundy, possessing fabulous terroir and living soils and wines that are vinified naturally with zero or minimal sulfur. The reds here are made with a unique combination of carbonic and traditional fermentations with zero added SO2. The whites are made in a Burgundian style, with very long, slow fermentations and long aging on the lees without racking, and usually with a small addition of SO2. “. 2017 Julien Guillot Bourgogne Aligote "Aligo-Rythm"
2016 Julien Guillot Macon-Chardonnay "Clos Fourneau"
2016 Clos des Vignes du Maynes Macon-Cruzille "Aragonite"
2016 Julien Guillot Beaujolais "Ultimatum Climat"
2017 Clos des Vignes du Maynes Macon-Cruzille "Cuvee 910"
2017 Clos des Vignes du Maynes Macon-Cruzille "Manganite"
On Tuesday, March 5th, we have the great pleasure to host Dany and Carole Chastan of the Clos du Joncuas in Gigondas for a truly exceptional winemaker dinner at Racines NY! We will pour the estate's current releases, including the superb Seguret Blanc, Gigondas Rosé, Seguret Rouge, Vacqueyras Rouge and Gigondas Rouge, as well as the 2015 Vieilles Vignes "Esprit de Grenache," and older vintages of Gigondas Rouge, including 2012, 2010 and 2006. Racine's wonderful new Chef, Diego Moya, will work with Sommelière Pascaline Lepeltier (Meilleure Sommelière de France 2018) to create a special menu based upon the traditional recipe's suggested by the Chastans. This will be a convivial evening of outstanding cuisine and wine, including lively commentary by Carole and Dany Chastan and Ms. Lepeltier (In French and English!) that should not be missed! Seating is limited - please order below - and we've included our current invotory of these distinctive wines for purchase. This Tuesday, join us at the bar at Racines NY for a tasting of superb, old-fashioned Gigondas, Vacqueyras, Seguret crafted with unique care by the Chastan family. David Lillie from and Pascaline will welcome Dany and Carole Chastan who run today the estate. In David's words: "Le Clos du Joncuas, founded in 1920 by Pierre Auguste Chastan, has always farmed with natural methods and has been officially organic since 1980. The estate's Gigondas vines are on slopes below the Dentelles de Montmirail on soils of clay with dolomite and gypsum over the limestone of the Dentelles and average 40 to 90 years old. Vinifications here are entirely old-school; whole-clusters fermented with wild yeasts in cement and aged in old barrels. Especially brilliant is the "Esprit de Grenache" from 60 year-old massale selection vines. Clos du Joncuas also has excellent parcels in neighboring Vacqueyras and Séguret. Rounding out their production is an oustanding Gigondas Rosé, certainly one of the finest in the Southern Rhône, and a superb Séguret Blanc made from 50% Clairette, with Roussanne and Marsanne. Although unknown in the US - the wines of Clos du Joncuas are not made in a style favored by most American wine writers - these are outstanding wines of terroir that benefit from three generations of natural farming and vinifications with minimal intervention. We urge you to try them!" Flight will be at $40, we will start to pour at 5.30. Chef Diego Moya will create for the occasion a special bar snack to go with the flight. Reservation is recommended at info@racinesny.com. TUESDAY NIGHT FLIGHT - 2/26 - A VINEYARD OF EARTHY DELIGHTS! This Tuesday 2/26 at the bar at Racines NY please join David Lillie and Pascaline for a fantastic flight of rare favorites. They will take you on a journey through Burgundy, Jura, Loire and Rhône, telling you the story of the amazing vigneron & vigneronne behind each bottle. Back on our regular schedule (after 2 weeks touring France with David & Eben Lillie to find new gems :)), when you can come and discover new wines, vignerons, regions, every Tuesday night at the bar at Racines. And for this come back we could not be happier to welcome one of our favorite winemakers - Damien Delecheneau from La Grange Tiphaine in Montlouis-sur-Loire & Amboise! Damien with his wife Coralie are probably today sone one of the most gifted, forward-thinking, soil-dedicated, and nice, producers in the Loire Valley. They are producing a superb range of wines, in every style and color, and everything is stunningly delicious! Please stop by starting 6pm Tuesday night to taste their fantastic work, and chat with the man himself! We will pour a flight of 6 wines for $40, including his new single vineyard Les Epinays, for its first official release (and soon to be a benchmark in the universe of dry #chenincheninchenin). No need to reserve! See you Tuesday! SUNDAY 4TH - ALICE FEIRING & RAW WINE FAIR AT RACINES NY! After a very successful first dinner paying tribute to the Loire Valley, we are moving North-East to go visit Champagne for our second stage of Racines' "Tour de France" Dinner Series on Thursday November 1st. For this dinner Champagne lover & expert John McIlwain from Chambers Street Wines put together a fantastic line up of wines exploring the different aspects of the region and style. 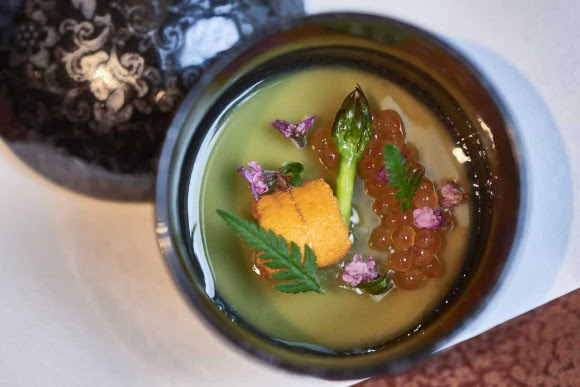 Once again Chef Paul Liebrandt will re-invent traditional dishes from the region, to be paired with a wild selection of both classic and off-the-beaten-path wines from our favorite producers. $250 per person (+ Tax and Gratuity) - Dinner starts at 7pm. TUESDAY NIGHT FLIGHTS - The New Spain! Ariana Rolich presents some of her favorite producers from Catalunya, Gredos and Galicia! This Tuesday, 10/30 join us for an exciting evening as our dear friend Ariana Rolich will focus on Catalonia, Galicia, and Gredos, pouring 6 wines by Oriol Artigas, Ruben Diaz, Terroir al Limit, Silice Viticultores and Els Jelipins. Come share Ariana's vast knowledge and enthusiasm for these unique natural wines! $35 for 6 half-pours, begins at 6pm at the bar! Please join us for a very special event, a tasting of the rare and scintillating Burgundies of Alice and Olivier De Moor, this Tuesday 10/23 beginning at 6pm! Arnaud, Pascaline and David will be on hand to pour five Burgundies from the De Moors including Bourgogne Blanc, Aligoté and Chablis, with a superb surprise poured blind, as well as the wonderful 2015 Vignes du Maynes "les Chassagnes" - $45 for 6 half-pours. Don't miss this opportunity to experience these beautiful wines! 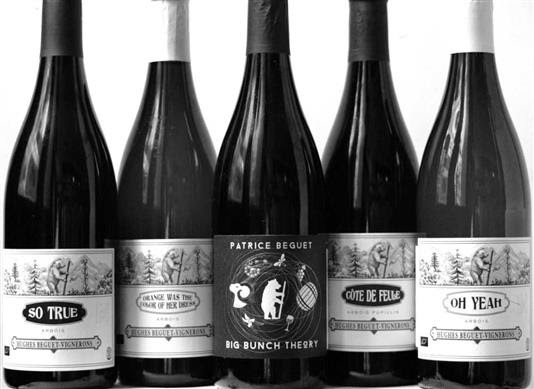 This Tuesday, the Racines NY team is very excited to welcome Eben Lillie who will pouring the spectacular natural wines of Patrice Béguet. In 2009, Patrice left the mathematics & the noise of the city for the beautiful Jura, and settled near Arbois with the desire to farm with the most respect his vineyards and make low intervention wines. Today, he takes care of roughly 4 hectares of vines in Mesnay, a little village located in Les Planches-près-Arbois gorge, mostly Savagnin for the whites and Ploussard for the reds. Thanks to the passion and research of Eben & David Lillie, his wines are now available in New York City. If your Graal is Overnoy-Houillon, you should open a bottle of Patrice… it won’t disappoint! And if you are not sure, join us Tuesday! These wines are not to be missed! No reservation needed. Please join us this fall as Racines NY and Chambers Street Wines team up to present some extraordinary events featuring our favorite producers of organic and natural wines, and the superb cuisine of Racines Chef-in-Residence Paul Liebrandt! Tuesday October 2nd: Wines of Savoie (with David Liilie) featuring the unique wines of Domaine Finot, Domaine Dupasquier and Domaine Lavie. We'll include the rare "Etraire de la Dhuy" of Thomas Finot, only 12 bottles for the US! Monday Octoner 15th: Melanie Tarlant and Gwenaelle Croix (Pepière) will present their superb Champagnes and Muscadets - at CSW from 5 to 7 and at Racines NY at the bar from 7 till 8pm! Monday October 22nd: Special Event featuring the wines of Emmanuel Houillon and "Les Donneurs du Temps." Only a few seats available, contact CSW to reserve. Tuesday October 30th: Ariana Rolich presents Natural Wines From Spain. Please join Ariana to taste an extraordinary flight of what's new and natural from Spain! Every Tuesday, we will be pouring at the bar at Racines NY some special flights of wines we love or we want you to discover. In collaboration with Chambers St you will be able to enjoy the work of superb vignerons dedicated to their land. This Tuesday, we will pour one of the most iconic estates of France, @domainehuet . Producing outstanding #chenincheninchenin since 1929, Huet is showing how Vouvray + Chenin + Great Farming = magical combination for age-worthy, terroir-driven, exceptional whites. We were lucky to open recently the 1945 which was absolutely transcendant. We will pour side-by-side the 2017 Sec from Le Haut-Lieu, Le Mont & Le Clos du Bourg - the 3 historic "Grands Crus" of the domaine, as well as the 2017 Demi-Sec Le Mont & Le Clos du Bourg + a special treat, Le Mont Moelleux 2002. @pascalinelepeltier will comment the wines and the vintage. No reservation needed, just pop at the bar! See you then!